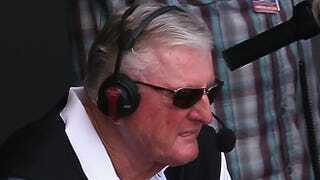 For years, broadcaster Hawk Harrelson has been the face of the Chicago White Sox. Players have come and players have gone, the Sox have been up and they’ve been down, but even more than a Mark Buehrle cutter or a Frank Thomas home run, Harrelson’s unique passion and commitment have defined the South Siders to the rest of baseball—and to America. At 75, though, and coming off a year in which he moved to a part-time role in which he only called road games, Harrelson is ready to step back and rest. “Put it this way: It’s that time,” he told Daryl Van Schouwen of the Chicago Sun-Times, who reported today that this will (likely) be Harrelson’s last season in the booth. He will, though, remain, as his broadcast partner Steve Stone calls him, “the face of the franchise.” With Harrelson serving in an ambassadorial role and making occasional guest appearances on Sox broadcasts, fans will have opportunities to hear about how a bad case of hemorrhoids cost him the 1968 Triple Crown for years to come.